A lot of us eat a little more than we should and want to stop eating so much, but it’s not as easy as we’d like. Some of us have a food addiction. Did you know there are foods that make you hungrier, and other foods that can suppress your appetite? White bread and white pasta are considered simple carbs. When we eat these foods, our pancreas goes into overdrive, causing an insulin spike. A short time later, our blood sugar levels drop suddenly and as a result of this “crash,” we’re hungrier than ever. When we look at fast food, it has a high salt content, and can make a person dehydrated. A person may think they are still hungry and eat more, when they are really just thirsty. Studies indicate these foods (and many others) release “feel good chemicals” in the brain like dopamine in a similar fashion to the brains of those who use alcohol or cocaine. Studies also indicate refined foods can lower the blood sugar and trigger the release of serotonin. Serotonin is believed to affect our mood, appetite, memory and other functions. If you notice, the foods that increase our appetites and have addictive qualities are not good for us. They are high in fat, sodium, and believed to cause a variety of health issues such as obesity, high blood pressure and diabetes. On the other hand, the foods that suppress the appetite are considered foods that are good for our overall health. This is very important information for all of us to know, but it’s especially important for parents. It’s critical we instill good eating habits in our children and avoid feeding them foods that are addictive and could be detrimental to their long-term health. The foods we eat can either help us or hurt us. Make an effort to avoid minimize foods that taste good but aren’t good for you. Next time you’re hungry, resist the urge to eat the processed foods and junk foods that are high in salt and artificial ingredients and eat something healthy instead. Your body will thank you. Or, just drink water. You may not be hungry after all! Categories: addiction, diet | Tags: addiction, diet, dopamine, hunger, kids, nutrition, parenting | Permalink. Once, one of my clients half-jokingly requested an exorcism from the demon possessing her body: hunger. Kind of a gruesome analogy but, truth be told, it’s fairly accurate considering how out of control she felt. When my clients struggle like this, I often say I wish I could wave a magic wand to make it all better, which of course I can’t. But what I can do is offer some tried and true advice to effectively rein in appetite and help regain a sense of balance. The five strategies below are tops for doing just that, and each also has the power to enhance your overall health. Win-win! Have you ever found yourself hungrier after working out, and then “ate back” more calories than you burned exercising? It’s a common phenomenon, and the trick to breaking the cycle may just be choosing ways of being active that feel like fun. In a recent Cornell University study, researchers asked two groups of adults to take a two kilometer walk before lunch or a snack. Those who were told they had been on an exercise walk wound up eating 35% more chocolate pudding for dessert at lunch and 124% more M&Ms at snack time than those who were told they had been on a fun, scenic walk. Other research shows that intense exercise—sweat sessions that are perceived as work—can lead to eating more overall. In other words, a “no pain, no gain” mentality may wind up wreaking havoc with your appetite. If you’re in a similar boat, try mixing things up. Trade grueling workouts for activities that get your heart rate up but seem like play. Think dancing, hiking, roller skating, and swimming. Many of my clients find that even if they burn fewer calories, engaging in recreational activities often helps them lose more weight, because they don’t experience rebound hunger spikes. Catching too few ZZZs is notorious for not only ramping up hunger, but also increasing cravings for junk food. One study from University of Texas Southwestern Medical Center found that too little sleep triggered excessive eating and weight gain, and getting more sleep slashed the consumption of carbs and fat, leading to weight loss. Another from the University of Chicago found that getting 4.5 hours of sleep (rather than 8.5) ups hunger and appetite, especially in the early afternoon. In addition to causing appetite craziness, sleep deprivation has been tied to a number of health problems, including weakened immunity, and a greater risk of type 2 diabetes, depression, and heart disease. For these reasons, in my opinion, making sleep a priority may even be more important than exercise for weight loss. If you’re falling short like most people, read up on ways to improve your slumber. Research backs what I find to be true for myself and my clients: drinking plenty of water can help manage appetite. One study found that people who drink about seven cups of water per day eat nearly 200 fewer daily calories compared to those who gulp less than one glass. 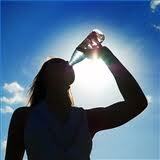 Another found that when adults drank two cups of water right before meals, they ate 75 to 90 fewer calories. A second study by the same researchers showed that when two groups of people followed the same calorie-limited diet for 12 weeks, those who downed two cups of water before meals lost about 15.5 pounds compared to about 11 pounds for the water-free bunch. Finally, a German study showed that a 16-ounce dose of water resulted in a 30% increase in metabolic rate within 10 minutes. The effect peaked 30 to 40 minutes after consumption, but was sustained for more than an hour. To take advantage of the benefits, drink about 16 ounces of H2O four times a day. If you dislike the taste of plain water, spruce it up with wedges of lemon or lime, fresh mint leaves, cucumber slices, fresh grated ginger, or a bit of mashed fruit. Your body loves consistency, which is why in my own personal experience, as well as my clients’, eating at the same times every day can go a long way in regulating appetite. Try eating breakfast within one hour of waking up and spacing your remaining meals about three to five hours apart. In addition to consistent meal times, strive for a steady meal structure in terms of the foods and proportions you include. For example, I recommend always including: produce, lean protein, plant-based fat (like avocado), and a small portion of a healthy starch. I’ve seen that mixing up the foods you choose within these categories, while keeping the types and quantities comparable, can have a huge impact on regulating hunger, supporting sustained energy, and creating a predictable return of hunger, almost like clockwork. In other words, when your meals are all over the place, it’s much easier to feel hungry all the time or confuse true hunger with boredom or other emotions. For most of my clients, stress is the number one eating trigger. And research backs the old adage: “stressed is desserts spelled backwards.” One recent animal study found that female monkeys chronically exposed to stress overate calorie-rich foods, unlike their calm counterparts. They also ate more throughout the day and evening, while the chilled-out chimps naturally restricted their noshing to daytime hours only. This behavior parallels what I see in so many people, and until they find effective ways to reduce stress, emotional eating is a difficult pattern to break. The best place to start: stop beating yourself up. Instead of berating yourself for not having enough willpower, acknowledge that when your stress hormones are surging, you’re programmed to reach for chips or chocolate. Speak kindly to yourself, and shift your energy toward testing out positive ways to cope, like listening to guided meditation, venting to a friend, spending time outdoors, reading, stretching, drawing, or whatever gives you a mini-vacation from the intensity of your emotions. That strategy, rather than “dieting,” is a much better way to set yourself up for successful weight control and better overall health. Categories: hunger | Tags: diet, exercise, hunger, sleep, stress, water | Permalink. In his new book What Are You Hungry For? The Chopra Solution to Permanent Weight Loss, Well-Being, and Lightness of Soul bestselling author Deepak Chopra discusses how overeating is really just a symptom of a much larger problem – an inability to find true fulfillment in our lives. Since living a healthy life after 60 is a goal of many members of our Sixty and Me community, I reached out to Deepak and his team to see if they would be willing to give us a sneak peek at his new book. I am delighted to let you know that they have given me permission to publish the following excerpt, so that you can be among the first to benefit from the insights in this important book. If you want to return to your ideal weight, two choices face you. You can go on a diet or do something else. This book is about that something else. Dieting involves the wrong kind of motivation, which is why it rarely leads to the desired goal. You are taking the route of self-denial and doing without. Every day on a diet involves struggling against your hunger and fighting for self-control. Is there a more unsatisfying way to live? Weight loss needs to be satisfying in order to succeed—this is the “something else” that works after dieting has failed. If you bring the body’s hunger signals back into balance, your impulse to eat becomes your ally instead of your enemy. If you trust your body to know what you need, it will take care of you instead of fighting back. It’s all about getting the messages straight that connect mind and body. Medically, I was trained to analyze hunger in terms of the rise and fall of certain hormones. Hunger is one of the most powerful chemical messages sent by the body to the brain. It shouldn’t happen that a person can feel hungry right after eating a meal or that having a snack in the afternoon should lead to a second snack or a third. But I’ve experienced these things—as have millions of people—which means that the experience of hunger can exist even when the need for food doesn’t. It’s this experience of hunger that you need to change when you find yourself overeating. Cravings and false hunger aren’t the same as giving your body the fuel it needs. Your body isn’t like a gas-guzzling car. It’s the physical expression of thousands of messages that are being sent to and from the brain. In the act of eating, your self-image is involved, along with your habits, conditioning, and memories. The mind is the key to losing weight, and when the mind is satisfied, the body quits craving too much food. With awareness, all of these things become possible. But if you neglect them, they move further and further out of reach. It sounds like a paradox, but to lose weight, you need to fill yourself up. If you fill yourself up with other kinds of satisfaction, food will no longer be a problem. It was never meant to be. Eating is a natural way to feel happy. Overeating isn’t. For centuries life has been celebrated at feasts, and some of these celebrations, such as wedding banquets and retirement dinners, can be the highlight of a person’s life. What child doesn’t brighten up when the birthday cake appears? But the delight that food brings makes overeating a peculiar and unique problem. Feeling happy, which is good for you, slides into something that’s bad for you. Overeating feels good in the moment but leads to bad results in the long run. Giving in to cravings doesn’t feel good at all—remorse, guilt, and frustration set in almost immediately. Being addicted to food brings suffering, declining health, and total lack of self-esteem. The slippery slope to becoming overweight starts with something that’s actually positive: the natural goodness of food. (You can’t say the same about drugs and alcohol, which can be toxic substances even when a person isn’t addicted to them.) Food nourishes us, and when eating goes wrong, we are torn between short-term pleasure (such as a delicious bite of chocolate ice cream) and long-term pain (the many drawbacks of being overweight for years at a time). So why does normal eating start to slide into overeating? The simple answer: lack of fulfillment. You start overeating to make up for a lack somewhere else. Looking back on my medical residency, when I was still in my twenties, I can see now how bad eating habits insinuate themselves. I’d come home from a grueling shift at the hospital feeling stressed out. My mind was still filled with a dozen cases. Some patients were still in jeopardy. What awaited me at home was a loving wife and a home-cooked meal. In terms of getting enough calories, sitting down to dinner met all the requirements. You had to look at the human situation to see the hidden problems. I had hit the coffee machine and grabbed snacks on the run at work. From lack of sleep I didn’t really notice what I was eating. The minute I walked in the door I usually had a drink, and there was a half-empty pack of cigarettes lying around somewhere. In the seventies I was a normal working male following the same habits as every other young doctor I knew. I counted myself extremely fortunate to have such a loving wife and two beautiful babies at home. But the ravenous way I dug into a nourishing home-cooked dinner, combined with all the other signs of stressed eating, was setting a pattern that was desperately wrong. Ironically, even back then I considered myself pretty aware. What turned the corner was becoming much more aware—the solution I’m proposing in this book. No matter how much it gets abused, the body can restore balance. The first rule is to stop interfering with nature. In its natural state, the brain controls hunger automatically. When your blood sugar falls below a certain level, messages are sent to an almond-sized region of the brain known as the hypothalamus, which is responsible for regulating hunger. When it receives messages of decreased blood sugar, your hypothalamus secretes hormones to make you feel hungry, and when you’ve eaten enough, the hormones reverse, making you no longer hungry. This feedback loop between blood and brain operates on its own, as it has for millions of years. Any animal with a spinal cord (vertebrate) has a hypothalamus, which makes sense, because hunger is so basic. Everyone needs to feel safe and secure. Everyone needs to feel nurtured. Everyone needs to feel loved and appreciated. Everyone needs to feel that their life is relevant and meaningful. If you have filled these needs, food will be just one delight out of many. But countless people turn to overeating to substitute for what they really want. It becomes a game of switch-up, and often they don’t even see what’s happening. Is that the situation you find yourself in? Here are some common indicators. You don’t feel secure unless you are dulled by eating too much. Dullness brings a kind of calm that lasts a short while. You don’t feel nurtured except when your taste buds are overstimulated with sugar, salt, and fat. Your life lacks meaning, but at least when you eat, the emptiness inside can be ignored for a little while. If you stop focusing so hard on diet and calories, the story of overweight in America is the story of missed fulfillment. We have the best foods in the world at our disposal, but we gorge on the worst. We have blessed opportunities to grow and evolve, but instead we feel empty. My goal is to bring you to a state of fulfillment. Once that begins to happen, you will stop eating for the wrong reasons. The solution is simple but profound: To lose weight, every step of the way must be satisfying. You don’t have to psychoanalyze yourself; you can stop obsessing about your body and dwelling in disappointment and frustration. There is only one principle that applies: Life is about fulfillment. If your life isn’t fulfilled, your stomach can never supply what’s missing. Reprinted from the book What Are You Hungry For? The Chopra Solution to Permanent Weight Loss, Well-Being, and Lightness of Soul by Deepak Chopra. Copyright 2013 by Deepak Chopra. Published by Harmony Books, an imprint of the Crown Publishing Group, a division of Random House LLC, a Penguin Random House Company. Categories: Uncategorized | Tags: diet, hunger, love, stress | Permalink.